Over the years, as I grew to love myself more, I gained more insight into all life has to offer. I finally had the chance to experience life when I cared less about how much I weighed, how many calories I ate, or how I looked in the mirror. Moving my attention and focus from such trivial matters opened new doors for me. I had more mental (and physical) energy to pursue more fulfilling areas of my life. Those ignited strong passions within me and now my life would feel empty without them. I have three great passions that provide me with so much – strength, purpose, love, confidence, opportunity for growth, and more. These passions continually make me a better person and allow me the opportunity to love my life and myself. For me, this is truly what life is all about. I feel I cannot do wrong if I have God at the center. Living my life for Him feels like opening a most special present every single day. I know great things await me because I can trust in Him. It helps me be more compassionate to all I come across and sharing kindness fills me up with joy. He gives me the example and capacity to love others and love myself. He opens my eyes to the many blessings in my life, so I can appreciate them. Knowing that He values me helps me value myself. He ignites me to live, which is something I didn’t want to bother with before knowing Him. Peter, Makenzie, and Braedon mean the world to me. I want to do all I can to support them and love them. Each day I work hard to care for them and ensure they know exactly how much better they make my world. I hope to support my husband every way he needs and encourage him as he encourages me. I strive for Makenzie (and soon Braedon) to grow in an uplifting environment and to truly know their worth. This blog serves as a place to share all my passions, including the big two I mentioned above. I adore all that goes into healthy living and cannot get enough of it – workouts, nutrition, self-love . Finding a community that enables me to share all I love and supports me in the process is, simply put, empowering. It has helped me grow and continues to push me to discover new interests. I never knew how much I adored writing. I never anticipated this blog would become such an ingrained part of my whole. I wish to never stop because I sincerely love it that much. That may sound cheesy, but I would be lying if I didn’t include it in my top three. Thank you for helping me to continue something I love so much. Having these passions in my life gives me meaning. These passions remind me of just how wonderful I am. I don’t mean that to sound conceited. God could do just fine without me. If Peter had never met me, I’m sure someone else could support him and love him just as much as I do. I certainly do not hold the belief that the blog world would lack something if I were not involved. I simply hope to express that finding passions gives me vitality and makes me appreciate myself more than imaginable. If you do not know them already, I urge you to find your passions. Try out many new things until you come across them. Consider what excites you and chase after it. Find something that ignites you. Make life more than just going through the motions. Embrace life with excitement and let your passions guide you. What things are you most passionate about? How do they affect your life? If you aren’t sure on a passion, what makes you happiest right now? Check out these bloggers who shared their personal thoughts on the 30 DSLR! Only one more day left! Thank you so very much. I needed this. You’re welcome! I hope you have a great day, Suzanne. I wanted to let you know I tried commenting on your blog, but have difficult on blogger blogs that don’t allow the Name/URL comments. I wanted to say that I hate how much hormones can affect us and hope you’re doing okay. I love the picture of you and your family. You look so happy and proud! 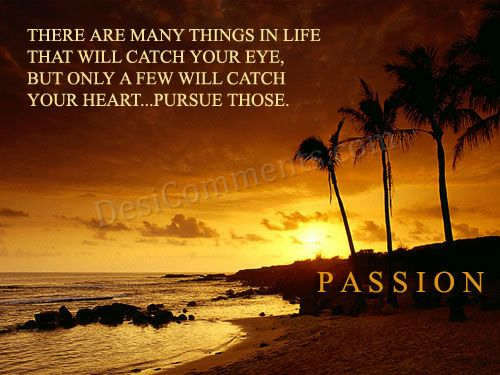 I think it’s so true that passion is what fuels us and makes us the best we can be. When we are passionate about what we do, little else matters. Passion! This is what I am seeking. Like many girls, as early as junior high I started allowing myself to become a shadow of the people I surround myself with, and I tended to seek strong minded, extroverted, passionate people. But, in becoming their shadows, I lost myself. In that darkness I expressed myself through art. As a child I drew and painted more than I wrote, but, into my college years writing became my passion. I wrote my first novel during my early years in high school. I have completed rough drafts of half a dozen more. I have dabbled in screenwriting. Have penned poetry and song lyrics as long as I can remember. And now express myself through blogging. While I have had writing slumps that lasted years, and while I have never been paid to publish anything, writing is my first passion. And my second is rediscovering myself. I am inspired by my daughter. She is one of those strong minded, extroverted people. She hasn’t discovered her passion yet, but the fact that she is who she is, has made me long for that self awareness. Ever since she left me an empty nester several years ago I have been searching for myself. I discovered my long lost love of weightlifting, remembered that blue is my favorite color, after five years of living in a bare walled house finally found art that moves me, and am beginning to become protective over my likes, my desires, my self. The third is God. God and I have been struggling, but without Him I would feel disconnected. While at times I doubt my worthiness for the blessings I pray for and wish for others, and while at times I direct my anger at God, I truly believe that God has a plan and purpose for my life, and I am trying to relinquish control and trust that he will reveal those plans to me in His own time. I fully recognize I am on a spiritual journey (which is why my new blog is about becoming spiritually and physically strong), and am finding passion in the searching, trying to choose joy in the living, and loving, and letting God’s light reflect through my own. Thank you, Tina, for this month! The self love and reflection has been a blessing. I’m passionate about my family and making sure to be loving and appreciative of every moment I have to share with them. I’m also passionate about positive thinking! And laughter. Those two things make my world a nice place to be. I like that. Being passionate about positive thinking is a good one to care about. Thoughts really can change so much. you have a beautiful family. thanks for sharing your passions. you have a great outlook on life. Fabulous post lady! So fabulous. Your passions are admirable. They will light you up forever! I used to not know passion. It was always there but I just buried it under useless worries like my weight, how thin I looked, how perfect my hair needed to be or what others in the world thought of my physical appearance. It’s hard thinking about how much those things consumed me for so long. But now I have passion. My first passion is being the best ME. Not someone else, not who I’m not. But being the best Jenn. Second is my family. My husband, our whole family (no kiddos yet!) mean the world to me. They inspire and guide and fill me up! Third is my passion in helping others. That is why I began my business. I finally realized how much I wanted to fill my day with helping others realize their potential, their health, their needs. It is incredible! Oh man that is the question of a lifetime! I like to help and interact with others. I secretly think that is the reason that we are all alive and the key to a fulfilling life. Right now, I am trying to figure out my other passions, so that I can combine my interests and share my passions while helping others. I am passionate about writing (I’m a writer), I’m passionate about inspiring other people to be their best selves, I’m passionate about my husband and about being the best couple we can be together. I’m passionate about doing good things in the world that make things better. Great, fantastic, awesome question! You’ve done great things this month. Congrats. What a lovely post Tina. My passion is serving others: My husband, my family, my friends, neighbors, strangers. I like to help other people in any way I can. Part of that is being a good example for others, for children, etc. Part of that is also being a good example of what a Christian is — I strive to be who God wants me to be — who I am! i am passionate about God, loving others, writing, food, and photography. i am passionate about my family and friends and living a life full of joy and not being afraid to fail. this was exactly what i needed to read today to re-remember all of that! Your posts always come at the perfect time for me. Obsessing about my weight and everything that comes alot with that (calories, food) has taken so much time away from me and just know am I beginning to realize this. You have a beautiful family Tina! Great post, Tina! It’s sad but true that many times we get so swept up in our day-to-day responsibilities that we do end up just going through the motions. It’s so important to step back, evaluate what really matters, and pour our energy into it. I’m passionate about excelling in my career, making my relationship with my boyfriend the best it can be, and giving my sweet puppy a good, active life! I love this post! Especially the part about your family. This was an awesome pick-me-up post! I knew when I woke up this morning I was not ready for this day to begin – that I needed to extinguish the feeling of waking up on the wrong side of the bed – but this post was the icing on the cake – THANK YOU! I am passionate about running, but more importantly being grateful for all that God has blessed upon my life – the boyfriend who fixes all the spuratic chirping smoke detectors and kills giant spiders, colleagues that are helping me compose a list of “Sh*t my Co-Workers Say”, my mother and her endless technology questions, my goofy pup. Life is good – especially when you’re passionate about it. This is one of my faves for Sept. Definitely puts things in the right light and puts perspective on things. I needed this today! I started off feeling less than “ignited” but as the day has moved forward, I’ve tried to find meaning in any small moment to help me keep going. Sometimes we think the passion’s lost, only to find it again! What a wonderful post. Thank you so much for sharing this. I am passionate about being a wife. I want for my husband to be happy. I believe that if he is happy then I am happy. We work as a team to have each other happy. I am passionate about positivity. It is technically a physical thing, but I believe it is pretty powerful. I believe having positive and optimistic outlook has greatly influenced my life and the relationship that I have with others. Positivity has helped me cope with so many things both good and bad. Positivity has helped me appreciate and realize how blessed that I am. I’m passionate about my marriage, healthy living, and family & friends. God is the center of my world as well and he has shown me that these areas are where my heart is. I love what you said about how you feel you can do no wrong with him at the center of your world. So true and that is a great reminder to me, especially right now while dealing with some work-related issues. I’m sad that the 30 days is almost over!!! I’m passionate about the support from family and friends. No matter what happens in life, how big, how small, as long as you have people to stand by you, it makes life that little bit easier. LOVE this. Life is is pretty boring when living without passion. So far I’ve been able to identify two of mine – writing and working with people. It’s taken some trial and error to find ways to include these in my everyday life (a brief and failed career in journalism comes to mind). But I believe I’m now moving in the right direction with blogging, freelancing, training clients, speaking engagements, running groups, etc. I really want to impact people in a positive way, and that’s why fitness has so far been a successful field for me. Also, I thrive on creativity. I need to be able to create something every day. Be it food, photography, a workout plan or a blog post! Fantastic post Tina and amazing comments from all of your readers! I am passionate about genuine kindness. No matter the circumstances I try to be as kind as possible even if the situation is less than desirable. I always try to keep it in the back of my head that there might be some outside reason driving the other individuals in the situation to be negative or harsh that I don’t know about and the one thing they could probably use most is kindness. I have to say that I struggle on this topic, not because I am not SO SO SO passionate about things in my life, but more because my focus has been almost entirely on this dad gum competition prep, which is kinda consuming my thoughts, time and talents. I want my relationship with GOD to be first and foremost the most passionate thing in my life and I feel like all I do is eat, sleep, breathe competition prep and I really miss my focus being more on GOD and less on myself, but at the same time its crunch time and I really have to focus, focus, focus on shaping my body and doing what it takes (how ever many hours) to get the job done. That being said, right now I am SO passionate about my goal to do this bikini competition and accomplish such a drastic change in my body. I have grown so confident and realized my own inner strength more during this training than I have my entire life and I just love it. As hard as it is, doing this makes me believe I can do ANYTHING and when this is over and I can relax, I just really want to focus more on God’s Kingdom and be passionate and zealous for HIM, not so much for myself and my own personal gain. I felt the EXACT same way when doing my comp prep. I will never regret doing the show bec it showed me strength that I could persevere and do it and I no longer wonder “what if”. However, at the same time I know I won’t do another because I felt like it consumed so much and it wasn’t really living my life how I do best. You can make it through though! I have faith in you and it is a big lesson. Your blog is such an inspiration to me Tina. I’ve been struggling in my life with a lot of things and feel lost sometimes. I know that I’m passionate about friends, my boyfriend, but that’s about it. I feel unfulfilled and like something’s missing a lot of the time. The past few months, I’ve been trying to find my passions and focus on truly LIVING life. I’ve been feeling more positive and healthy since doing so. I can only keep trying…sorry to ramble. Thanks for your great posts Tina! And thanks for your replies, Melissa! I always love reading them. I think all you can do is just focus on making the most out of each day. Not every day will be grand, but when you look back on those special ones you usually find a common theme. That’s what I found at least. And those helped me discover my passions and what I wanted my life to revolve around. So keep on living it up. My passions are my family, both my family of origin and my new chosen family (made up of my partner and friends), working to end violence against women, and being connected with nature/the world around me. I’m also passionate about my future family- having children and a farm are very important to me. thanks again, for challenging and inspiring. Tina this was a great topic and one that I have been thinking a lot about lately. My relationship with God is very important to me and I am passionate about being the best me I can be. I have been asking Him to show me what gifts He has given me, as the Bible tells us that He has given each of us gifts He wants us to use. I am realizing that the things I am most passionate about are the gifts He is talking about. In the past I have gotten involved in so many things that I have not been passionate about because I don’t know how to say “no” to people. When you are in things you are not passionate about, it really is an energy drainer. Since I started weeding out the things that I am not passionate about and getting involved with things that truly inspire me, I am seeing the gifts He has given me that make me unique. I am realizing that if something is a struggle and a fight for me every day, I probably am not where I am supposed to be. Using my gifts should come easy and be somewhat fun. There is such peace in finding your passion. Great point! If something is a struggle all the time and we hate doing it, then its not what we’re meant for. I didn’t say this in my blog post (oops!) but for me, finding other things I enjoy (blogging, reading etc) gives me less room for binge-eating. I am side-tracked. I have other things on my mind. Other things give me joy. In my post I say that I want to find more things to feel passionate about, so I need to keep searching (PS. particularly for one over 6ft, 40 – 45yrs, any hair colour, nice arms and smile, able to string a few sentences together etc etc!!!). I am very passionate about everything music. I love picking up instruments and learning. I love dancing. I love listening. I love concerts! And I am going to school to be a sound engineer. I truly love everything music related and am thankful I still have my ears to hear it. I am passionate about taking care of my body and feeling good. I make sure I get the exercise I want and need, and normally try to eat healthy, nutritious foods.